It is a very foggy and cool morning. 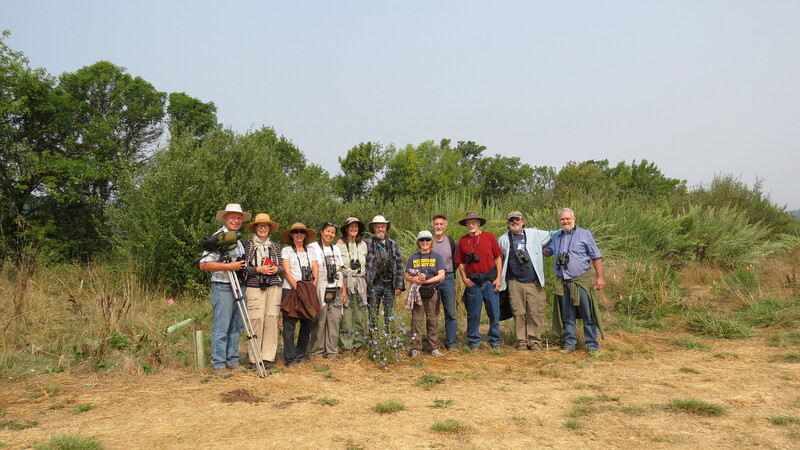 We are a group of 12 brought together by our interest in the Tule Elk of the Willits Valley. I have been looking for them all week hoping to scope out where they might gather so we can all see them. The path we are taking is through the pastures on the west side towards Outlet Creek. We will cross the dry creek bed and head directly east along the city fence line. Last week this field is where I had seen the main herd. As I lead this walk, I begin sharing some of the facts I had read about this subspecies of Tule Elk, Cervus canadensis nannodes, or Wapiti, the white-rumped ones. 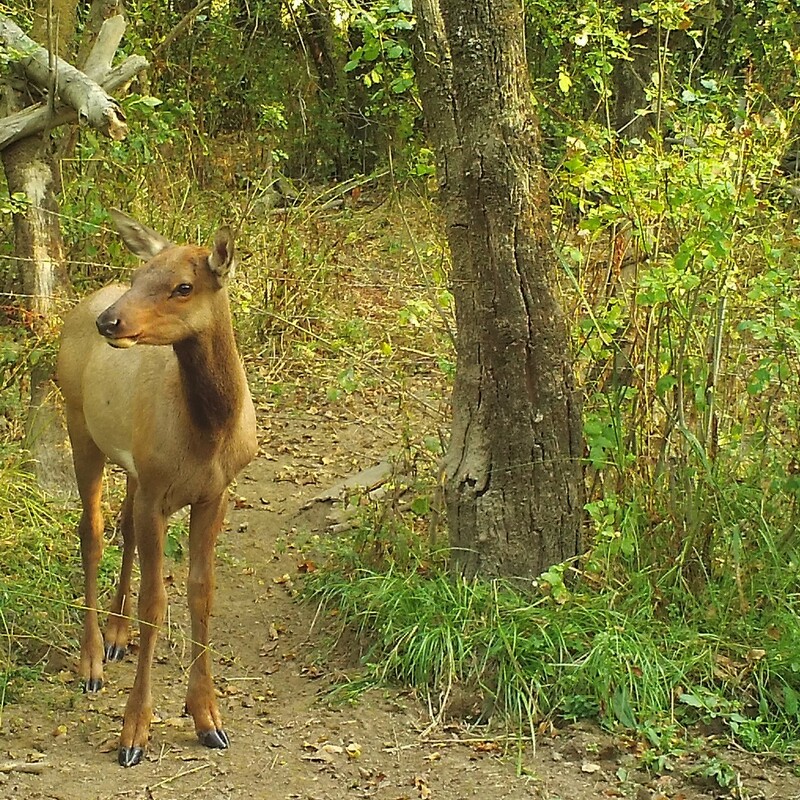 It is the smallest of the 4 remaining subspecies of North American elk and is endemic to California, or only found here! It was surprising to learn that before the Goldrush in 1849, there were reported about 500,000 elk in California. By 1870 the elk were virtually exterminated for food and agriculture and no one reported seeing any until a fluke incident in 1879. 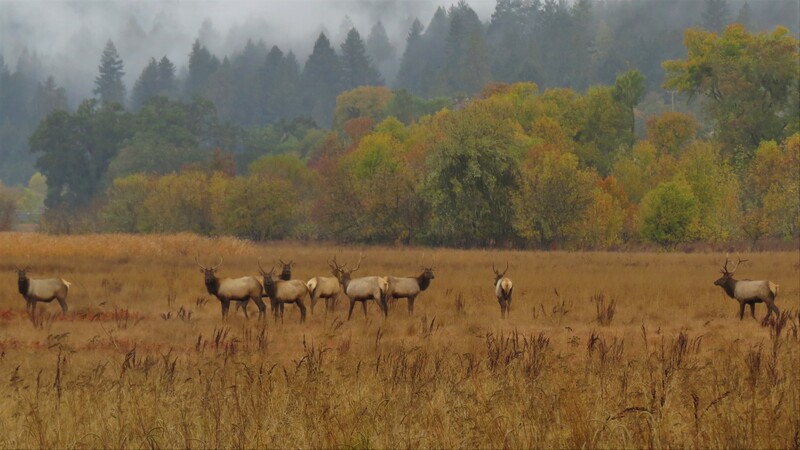 A farmer, named Henry Miller, was draining a wetland for agriculture and found a very small number of Tule Elk hiding in the Tules. The number is not clear but it was between 4 and 20 animals! From half a million to a handful is indeed a sad story and the fact they exist at all is because of that farmer. He realized these were the last ones and decided to preserve them. Since then the herd of Tule Elk has grown to 4000 with the help of a bill passed in 1971 called the Behr Bill, the Tule Elk Preservation Act in 1976, and conservationists We are lucky to have them on the mitigation lands where we can have a close connection with them. This time of year, late summer and early fall, the” rut” has begun. This is when the Bulls, the male elk, begin to challenge each other for the control of most of the Cows, the female Tule Elk. The largest most powerful bull chases out the younger and weaker bulls so he can monopolize the females. This dominant bull will make a loud call during this time that is called bugling. The sounds of the bulls bugling is a wonderful and sometimes eerie sound. It is not really a bugle sound to me, more like a wheezy high pitched whistle. The Cows, on the other hand, have just come out of hiding with their young calves and are busy nursing and protecting them. They also make sounds calling their young to them if they get separated. The dominant bull gathers the females with the young calves and protects them from other bulls and predators. 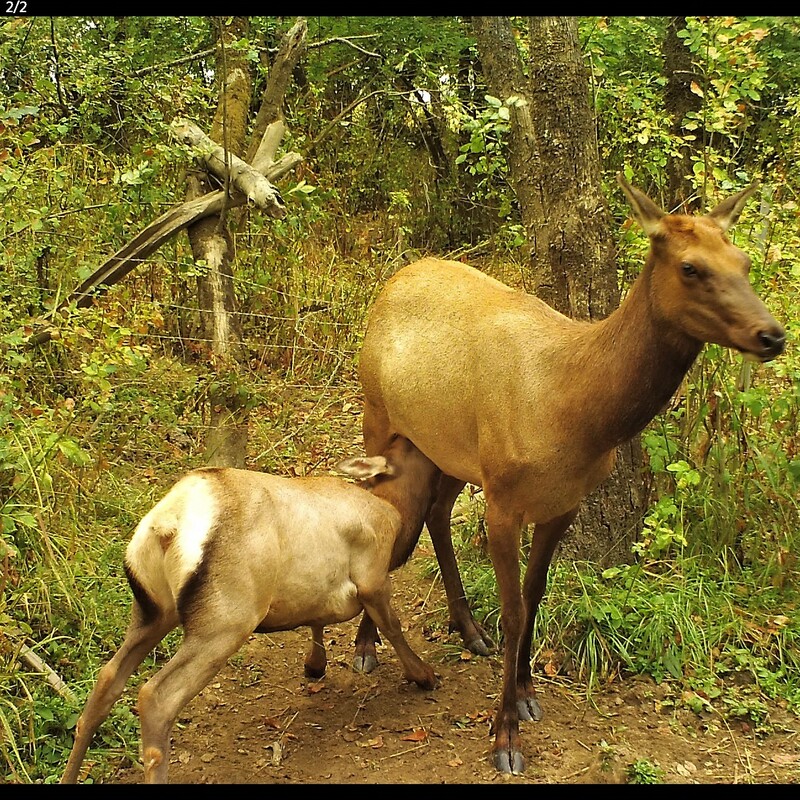 Besides their obvious size differences, Black-tailed deer and Tule Elk have other differences. The deer, Odocolleus hemionus, have much larger ears and a black tip to their tails. They do not sport the large white rump that the Tule Elk have. Elk are both grazers and browsers whereas deer are primarily browsers. As we walk along we try to be as quiet as we can so the herd, if present won’t disappear on us. these animals are super vigilant and since the valley floor is mostly flat, the visibility is ideal. Our first stop at one of the pasture gates reveals the herd of at least one large Bull Elk with quite a few Cows and calves. When we put the scope on them, not only can we see there are 2 young calves with spots still on them, but we can see that all eyes are turned toward us! We step back from the fence and make our way to another viewing spot. Here we watch as they slowly move to the east out of sight. It is always so thrilling to see these majestic animals We continue walking to the east, through a shady grove of large Ash trees. Under these lovely trees, we find many kinds of feathers. Red-shouldered Hawks, Barn Owl. Wild Turkey. even a Wood Duck feather. As we get to the other side of the grove of trees we see our last glimpse of the elk herd. It moves southward, away from us as a couple of young females appear to be running in circles. We wonder if they have gone into heat. It has been a good day of Tule Elk hunting, the group turns back contented. So great to get to share the elk like this!